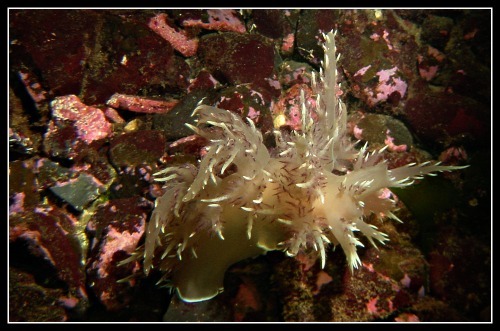 Keel Cove in Nanaimo, BC is a good shore dive, with decent access from a beautiful and secluded beach. The real challenge of this dive is to negotiate a fairly short, but steep trail that leads down to the beach. Some divers will carry their BCD and tank down separately, suiting up on the beach. Save this dive for dry weather as it can be slippery if wet or icy! The dive here boasts the strong possibility of a Sea Lion encounter, a shallow reef, and a small wreck (or what's left of it) to explore. This is not a very deep dive, (about 70ft, 21m) which makes it suitable for all levels of diver. There is not to much left of the wreck, but what remains is enough for a few marine animals and fish to call home. Generally we go straight out and check out the wreck, and while on the return, take a swim along the reef before heading back in. The site also has a rope to follow along the bottom which will take you to the reef, and then beyond to the wreck. As you stand on the beach, the rope begins very close to the point on your left in fairly shallow water. You will find this rope a quite handy, especially if the visibility is poor! Turn on McGuffie Rd. from Hammond Bay and follow it a short distance where it will branch to the right. Park at the end of this road where you will then make your way down a short steep slope to get to the beach. As I mentioned, it's steep so watch your step! To do this dive go in at the far end of beach, (it's not far) and enter the water there, then head straight out, "north" and drop down near the point on your left. Look for the rope along the bottom, but if you don't find it no problem. This site is a natural zero degrees out, so continue on that heading until you reach the reef which is only a few minute swim (it runs to the left or west, parallel to shore) and then follow the reef out and back, or continue on the same heading and you will reach what is left of the old sailboat.